Horse Pasture Management begins with coverage of the structure, function and nutritional value of plants, continuing into identification of pasture plants. Management of soil and plants in a pasture is covered next, followed by horse grazing behavior, feed choices of horses, management of grazing horses, and how to calculate how many horses should be grazing relative to land size. Management of hay and silage are included, since year-round grazing is not possible on many horse farms. A number of chapters deal with interactions of a horse farm with the environment and other living things. As an aid in good pasture management, one chapter explains construction and use of fencing and watering systems. 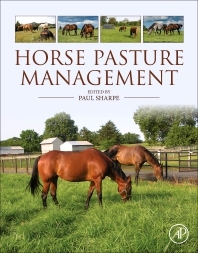 Contributions are rounded out with a chapter explaining how the University of Kentucky helps horse farm managers develop their pasture management programs. First of its kind! Very Comprehensive! This book is a wonderful teaching tool, or informative book for the serious farm owner! If you are teaching a forages class you need this book! If you are a farm owner and want to take care of your land and pastures you need this book! Everything you need is all here! I really like how the book was put together. A great job by all authors and editors. Loved the textbook- each chapter well presented. Highly recommended to my colleagues in the equine program..